I've never been a fan of liquid eyeliners with those thin flimsy brush applicators. Which is why I love this one because of the sponge-tipped pen applicator that is so easy to line my eyes with. The color is glossy black and very pigmented. It's not like one of those sheer black liquid eyeliners you have to pile on to get the black-black. It is not waterproof, which I like in a liquid liner. The waterproof ones tend to crack! It is Ophthalmologically tested, which I guess is gonna be good for my sensitive eyes. Available in all L'Oreal counters and priced at Rs.570. A little overpriced for a liner, in my opinion. Looks like it should cost no more than Rs.500 to me. Applied shimmery white eyeshadow on the brow bone and tear ducts. Lined the waterline with Black Maybelline Unstoppable liner and smudged the outer corners with the same chocolate brown eyeshadow. 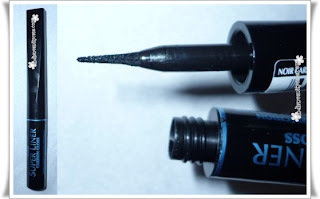 Have you all tried this liner? is that a good applicator i just saw? the lines you made are so clean! that applicator looks so nice and sturdy. good plan to save it for future. Thanks for the review! 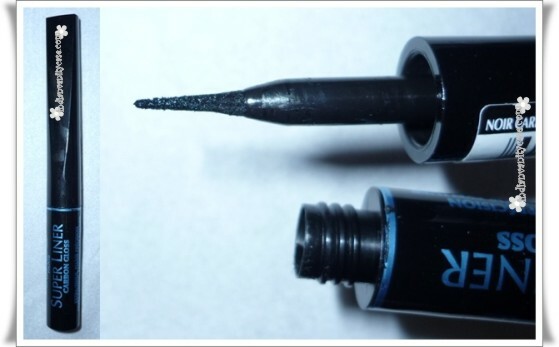 !I really need a new liquid eyeliner and I'm definately going to take this!!!! Oh girl, I need a liner like that! The sponge applicator does look nice and sturdy! Really beautiful makeup.I love your pink site:))Thank you Cynthia!Happy Easter!! I've not tried this but heard many good things about it. I am in love with my Bourjois Pinceau Liner in Black. The liner brush is super thin so it gives me better control. haven't tried that liner, but it looks really good. I really like this look! it suits your eyes very well. Awesome Eye makeup Cynth..I like the eye shadow colour. Pls do an eyeshadow tutorial! eye make is so Pretty ! does the maybelline liner you used for lining you waterline stay put or does it smudges like kajal?? and can it be used with contact lenses..?? @Wanderlust~ Will do very soon. it's the other way around for me, i like the brush applicators. Pretty <3 I heard good things about this eyeliner!! I am going to get this one after I am done using my current one!! pretty eyes! love how u blend the colors!